Note that you may generate events yourself, using event number 9, which is reserved for users. You may also get an allocation of an event number from Acorn if you need one - for example, if you are producing an expansion card that generates events. Generating events all the time would use a lot of processor time. To avoid this, events are by default disabled. You can enable or disable each event individually. To avoid problems with several applications using events at the same time, RISC OS keeps a count for each event. This count is increased each time an event is enabled, and decreased when an event is disabled. Thus disabling an event will not stop it being generated if another program still needs the event. RISC OS sets all event counts to zero at each reset, although some of its system extension modules may need events, and so immediately increment the counts. disable the event on all kinds of finalisation. To use event(s), you must first OS_Claim the event vector EventV. See the chapter entitled Software vectors for further details of vectors. You must then call OS_Byte 14 to enable each of the events you wish to use. When an event occurs, your event routine (that claimed the event vector) is entered. The event number is stored in register R0; other information may be stored in R1 onwards, depending on the event - see below. The restrictions which apply to interrupt handlers also apply to event handlers - namely, event routines are entered with interrupts disabled, with the processor in a non-user mode. They may only re-enable interrupts if they disable them again before passing on or intercepting the call, and they must ensure that the processing of one event is completed before they start processing another. The use of certain operating system calls must be avoided. For further details see the chapter entitled Restrictions. Note: Events may not be received in the order in which they are generated. When you finish using the events you must first call OS_Byte 13 to disable each event that you originally enabled. You must then OS_Release the event vector EventV. Note that to disable an event totally, you must use OS_Byte 13 the same number of times as you use OS_Byte 14. When you finish using the vector, you should disable it again by calling OS_Byte 13. Note that, as usual, the event vector will only be called if the event number given in R0 has previously been enabled using OS_Byte 14. Details of all the events and the values they pass to the event routines are given below. This event is generated when the last character has just been removed from an output buffer (e.g. printer buffer, serial port output buffer) which has output empty events enabled, or an attempt is made to remove another character from the buffer once it has been emptied. See the chapter entitled Buffers. This event is generated when an input buffer (which has input full events enabled) is full and when the operating system tries to enter a character into the buffer but fails. See the chapter entitled Buffers. Block operations do not occur in RISC OS 2, nor do they occur for buffers that are not handled by the buffer manager. This event is generated when OS_Byte 153 is called to insert any character except Escape into the keyboard buffer, or into the serial buffer when serial input is treated as keyboard input (ie OS_Byte 181 is set to zero). If the character is Escape, then the Escape event is instead generated. See the chapter entitled Character Input for a description of buffer values for the keyboard buffer. 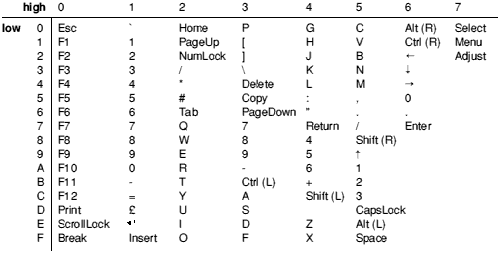 OS_Byte 153 is called by the keyboard driver to insert keys into the keyboard buffer, and by the serial device driver when it receives a character. This event is generated when the analogue-to-digital convertor on the BBC I/O expansion card finishes a conversion. See the documentation supplied with the card. This event is generated when the electron beam reaches the bottom of the displayed area and is about to start displaying the border colour. This event corresponds to the time when the OS_Byte 19 call returns to you. In low-resolution modes this will be every fiftieth of a second; in modes requiring a multisync monitor it will be more frequent. You could use it, for example, to start a timer which will cause a subsequent interrupt. On this interrupt you could change the screen palette, to display more than the usual number of colours on the screen at once. This event is generated when the interval timer, which is a five-byte value incremented 100 times a second, has reached zero. See OS_Word 3 for details of the interval timer. The interval timer is obsolescent, since there is only one provided, which is not very useful in a multi-tasking environment. You should instead use OS_CallAfter or OS_CallEvery. This event is generated either when Esc is pressed, or when an escape condition is received from the RS423 input port and OS_Byte 181 is set to zero. See the chapter entitled Character Input for a discussion of escape conditions. This event is generated when an Econet user remote procedure call occurs. See the chapter entitled Econet for further details. This event is generated when you call OS_GenerateEvent with R0=9. The other registers are as set up by you. Note that this is entered in SVC mode, not IRQ mode. Where there is some ambiguity, eg the digit keys, it should be clear from referring to the keyboard layout which code refers to which key. The keys are numbered top to bottom, left to right, starting from Esc at the top left corner. 4D is unused on the UK model, but may be used on some other models for an extra key. Note that the keycodes given in this event bear no relationship to any other code you will see. They are not, for example, related to the INKEY numbers described in the chapter entitled Character Input. They apply to the keyboard supplied on the UK model. This event is generated whenever the sound beat counter is reset to zero, marking the start of a bar. See the chapter entitled The Sound system for more details. The 0 in R2 may change in future versions to give the invocation number of the task causing the event. This event is claimed by the PC Emulator package. This event is generated when an Econet reception completes. The status returned in R2 will always be 9 (Status_Received). See the chapter entitled Econet for further details. See the chapter entitled Econet for further details. 2 The scheduler queue is about to empty, and you can schedule more data. These events only occur if you have fitted an expansion card with MIDI sockets. See the manual supplied with the card for further details. 2 A socket connection is broken. These events only occur if you are using the Internet module supplied with the TCP/IP Protocol Suite. See the TCP/IP Programmer's Guide for further details. This event is generated when the SWI DeviceFS_ReceivedCharacter is called on an unbuffered stream, and the previously received character has not been read. The new character overwrites any previous character. This event is generated by a driver to indicate to the Internet module that it has received and stored a frame from the network. This event is not used by DCI4 versions of the Internet module, such as the one in RISC OS 3.6. This event is generated by a driver to indicate to the Internet module that it has completed a transmission request. It does not necessarily imply successful transmission and reception by the target host. This event is generated by the Portable module when it receives interrupts from the BMU (battery management unit). You must not claim it yourself. See the chapter entitled The Portable module for further details.